Apache600 present a new DLC with Mig-15Bis and F-86F campaign on a package. After many months of hard work, I am pleased to announce that I will soon be releasing "The Museum Relic". A campaign for both the Mig-15 and F-86. This is actually two separate campaigns. You can choose to fly the Mig-15 (which has other Soviet units as its friendlies). Or the F-86 (which has NATO allies). Both campaigns follow the same story line. 22 Story driven missions for each campaign. Over 400 lines of custom voice recording for each campaign from 17 different voice actors. (Total of nearly 600 voice recordings for both campaigns. Many recordings needed to be campaign specific for differences in Imperial and Metric values, as well as Unit types). 160+ pages of briefings and detailed flight plan pages. A fun story that gives the Mig-15 and F-86 a place in this fictional modern day setting. The Museum Relic will be available soon in a DCS store near you! I am happy to announce that I have started work on a new DLC campaign for A-10C. It will be set in the NTTR and will be aimed mainly at new players, containing between 15 - 18 missions with all the basic information and instructions required to master all the systems that would be useful in mostly (but not only) single player flying in the A-10. Judging by many posts in these forums there is a need for such a campaign, after which one could either test his skills in excellent Basic Flight Training Qualification campaign by MapleFlag or in the Enemy Within or upcoming DLC prepared by Ranger79. Apart from the instructions and interactive trainings each mission will contain a part in which you will have to put the newly acquired knowledge to use and fulfil different tasks given to you by your Instructor Pilot (IP). Last few missions will simulate a complex battlefield where once again you will have to prove that you know how to effectively use the Hog. Moreover, the campaign will have its own storyline and will be first in series of linked campaigns sharing the same background (international situation) as well as some of the characters (the next one being Red Flag for M2000C). More details to come! You can thus expect that what you have seen in The Enemy Within and what you will shortly see in the M2000C campaign, but probably pushed to a new level with improved radio comms quality, many more voiceovers, complex triggers and (hopefully) lots of fun during the training. I am joining forces with Doughboy from 319th VFW, who served in NTTR and also was deployed with the A-10s in Afghanistan. So you can expect high degree of realism and some interesting stories in all the missions. Finally, a disclaimer - this campaign does not aim to recreate way of operating the jet in real life to 100%. To get as close to realism as possible you would have to join and learn from one of the great multiplayer squadrons. This campaign will teach you how to effectively use different systems and weapons in DCS environment, of course trying to adhere to procedures used IRL as much as it makes sense for a single player experience. F-5E: Aggressors BFM by Maple Flag release. 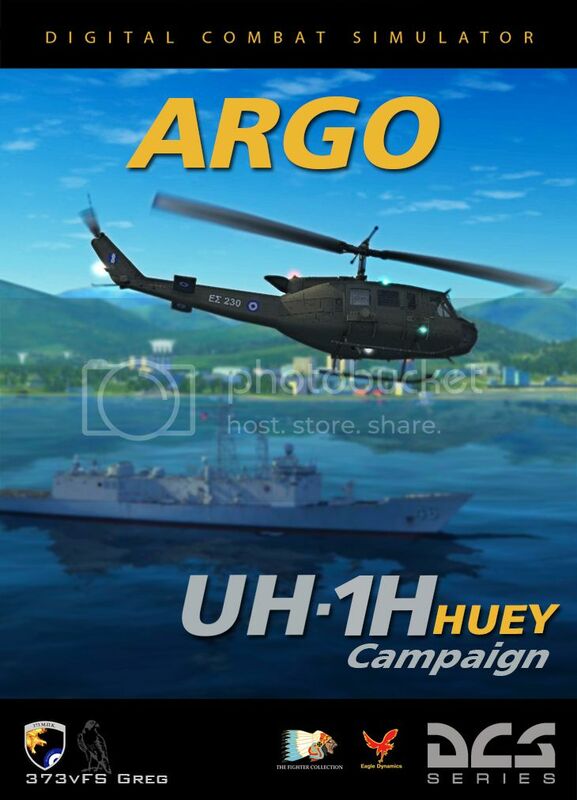 New official DLC campaign on develop by 373vFS Greg to BSK UH-1H, named "ARGO"
It is with great pleasure to announce that I am working on the release of an official DLC Campaign called "Argo", for the UH-1H module for TFC/ED in the upcoming months. Work started some months ago and the aim is to build a realistic and demanding environment in which you will enjoy flying the Huey in its full capacity. "Argo", is a story driven campaign consisting of you in the role of an experienced Greek UH-1H pilot with many years of service in the Hellenic Army Aviation. Recently you and a number of active Huey pilots were transferred in the Hellenic Navy. The campaign starts on July 2017. NATO Exercise “Sea Breeze” is taking place once more in the Black Sea. This year, Georgia’s Batumi port is being used as a base for all the allied naval forces. The countries that participate in the exercise are Bulgaria, Georgia, Greece, Lithuania, Italy, Moldova, Poland, Romania, Sweden, Ukraine, Turkey, the United Kingdom, and the United States. One year after the US-led coalition’s operations in Iraq’s city of Mosul, Georgia accepted a large wave of refugees arriving through Turkey. NATO wanted to show its support by conducting the exercise in Georgian Territory. For the needs of “Sea Breeze” exercise, Hellenic Navy's frigate ARGO FFG-46, sailed towards Batumi in order to provide support to the NATO Fleet and the rest of the Greek Forces. Recently Greece successfully negotiated with the United States Government, about a military partially funded assistance program, which included the purchase of 4x retired Oliver Hazard Perry-class frigates of the US Navy. The frigates were modernized last year with new Radar & Phalanx systems to get ready for foreign sales. You and your UH-1H were assigned to the new Hellenic Navy Frigate ARGO FFG-46 which was previously known as USS Rentz (FFG-46). The frigate is still operating under US flag until its crew completes its training to the new weapon systems. Your Huey is getting refueled and ready for the exercise. More details will follow as work continues. I hope you like the concept and will enjoy the missions once ready.